MARKHAM – Along with its own vibrant history and distinct sense of community, the former milling village of Thornhill has an unusual quirk: it is split, right down its middle, between the two neighbouring municipalities of Markham and Vaughan. That has a lot to do with the fact that Thornhill’s history has relied heavily on the development of Yonge Street – Canada’s longest road, which, between Steeles Avenue and Highway 7, also represents the boundary between the two cities. In fact, if it weren’t for Yonge Street’s initial extension to the area in 1793 – commissioned by Upper Canada’s legendary first Lieutenant Governor, John Graves Simcoe – Thornhill, as we know it today, may not have even come into existence. According to the town’s official history, Thornhill takes its name from Benjamin Thorne, an influential resident who moved to the area in 1820. In addition to running a successful import-export business, Thorne established a number of important services in the town, including a sizeable grist mill, a tannery and sawmill. Thorne and his brother-in-law were also responsible for a petition that, in 1829, secured the village its first post office and the official name of Thornhill. While the York Regional Municipality Act of 1971 did finally integrate Thornhill’s territory into Markham and Vaughan, the historical remnants of Thornhill’s past as an independent village remain a major component of the area’s character and desirability. In what will comprise the first of a two-part series, this month we take a look at Thornhill east of Yonge Street – the component that falls within the boundaries of the City of Markham. Just like its western counterpart, Markham’s portion of Thornhill has historically been a real estate favourite thanks to its generous selection of detached homes. Whether you’re in the market for a charming bungalow on a well-treed, mature lot, or a sprawling executive-style home with garage space for three cars, chances are you will find a home that meets your budget. East Thornhill’s quiet, pedestrian-friendly residential streets are perfect for growing families, as they are usually never far from public green spaces such as Don Valley Park and Bayview Glen Park. Low-rise homes, however, no longer constitute the only real estate offering on display in this rapidly-maturing neighbourhood. The 1991 completion of eastern Thornhill’s first major high-rise condo community – the ambitious Landmark Condos, whose three towers enjoy high visibility where Bayview Avenue meets Green Lane – turned out to be an act of foreshadowing as now, decades later, the area has re-emerged as a viable hotspot for high-density development. Avignon on Bayview, a six-storey community located just north of Steeles Avenue, was completed in 2004 and features a blend of spacious layouts that allow for plenty of interior square footage – a commodity that can be tough to find within Toronto’s borders just to the south. This luxurious community, which features interiors by Tas DesignBuild, was profiled by Toronto Life in 2011 when one of its condos listed for an impressive $1.99 million. Over the past couple of years, however, the area’s vertical inclinations have taken a huge leap forward with World on Yonge – Liberty Development’s ambitious high-rise mixture of residential condos, an indoor mall, and office tower with hotel suites. Situated at an enviable location right on Yonge Street, just a short walk north of Steeles Avenue, World on Yonge’s modern design – which includes eco-friendly features like a sustainable green roof and landscaped courtyard – was recognized as a 2011 winner of the Building Industry and Land Development (BILD)’s award for Places to Grow Community of the Year (High-Rise). East Thornhill’s many parks are complemented by an equally impressive abundance of elementary schools, including Johnsview Village Public School, Bayview Fairways Public School, German Mills Public School, Bayview Glen Public School, St. Michael Catholic Academy, Baythorn Public School, Woodland Public School, and St. Anthony Catholic School. 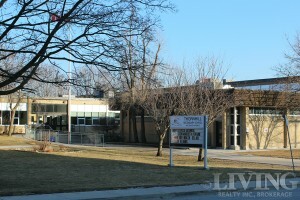 The area is also home to three high schools – two administrated by the York Region District School Board and one by the York Catholic District School Board. From its central location just northeast of Yonge and Steeles, Thornhill SS has been operating as a secondary school since 1956, and in addition to supporting various co-curricular programs – including a Gifted stream, a music program, and even a High Performance Athlete Program – offers students access to innovative facilities such as a Communication Technological Lab. 89 per cent of Thornhill SS’s its first-time eligible grade 10 students successfully completed the 2013-2014 Ontario Secondary School Literacy Test (OSSLT) – a full six percentage points higher than the province-wide pass rate the same year. Located on Bayview Avenue a short distance north of John Street, Thornlea SS proudly offers four specialized student programs: Advanced Placement (AP) & Pre-AP, Specialist High Skills Major programs, French Immersion, and an Academy of Creativity and Multimedia. Thornlea SS’s academic-enrolled Grade 9 math students achieved a 91 per cent success rate on the 2013-2014 Grade 9 Assessment of Mathematics – matching the board-wide rate and beating that of the province by six percentage points. Located on Leslie Street in the northeastern end of Thornhill, St. Robert Catholic High School celebrates its 40th anniversary in 2015. A perennial top contender in school ranking lists, the school’s roughly 1,550 students enjoy access to a broad array of facilities, including a covered soccer dome, garden, chapel, and two music rehearsal halls. St. Robert’s students excelled on provincial academic testing during the 2013-2014 school year, achieving an impressive 92 per cent success rate on both the Grade 9 Assessment of Mathematics (among academic-enrolled students). First-time-eligible Grade 10 students writing the OSSLT also achieved a 92 per cent rate of success, handily surpassing that year’s percentages for both the board and the province. With roughly two dozen parks located within its boundaries, Thornhill’s Markham half offers a wealth of outdoor space for local families to enjoy – a major inherent benefit of choosing to live north of Steeles Avenue. Located just southwest of the intersection of John Street and Don Mills Road, German Mills Settlers Park is home to a diverse ecosystem that includes more than 70 species of birds and 15 mammal species. In 2012, the City of Markham council voted against a plan to build a bioreactor landfill within the park – helping ensure that nature lovers can enjoy the park for years to come. Just off of Steeles Avenue west of Leslie Street, the (members-only) Bayview Golf and Country Club’s renowned 18-hole championship course is complemented by a huge range of alternate activities, including curling, tennis, and an outdoor swimming pool. With an exceptional location at the heart of the World on Yonge development, the recently-opened Shops on Yonge is eastern Thornhill’s newest destination for shopping and dining – with more than 100 businesses already leasing across three storeys of retail space. For home buyers considering moving to York Region, eastern Thornhill is a naturally popular choice – after all, few other neighbourhoods offer the prestige and comfort of a City of Markham address, without having to live too far from Yonge Street and the City of Toronto. 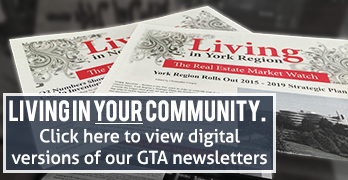 Whether you are interested in purchasing a newer condo in a community like World on Yonge, or looking for the perfect detached home for your growing family, we recommend getting in touch with a member of the Living Realty sales team. The brokerage has been actively buying and selling properties in the area for more than 30 years – and the Broker of Record, Stephen Wong, personally calls the neighbourhood home.